Keep your users secure with the two-step SMS authentication. Two-step authentication is a mechanism to double check that your identity is legitimate. 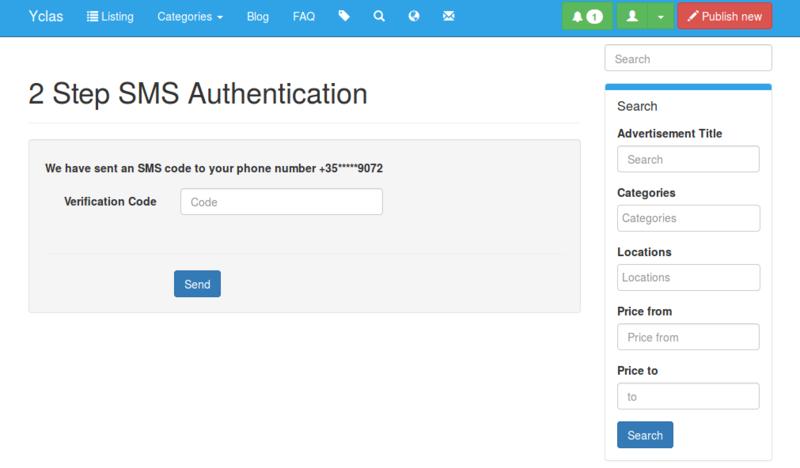 Now customers that set a phone number in the profile will have the 2 step sms authentication. This option will make it easier for your customers to login or register to your site. Select the country your website is targeted to. This way, the country’s code will be the default country code in the phone field in the register, login and publish a new page. Go to Settings -> General -> Regional -> Country and select the country your website is targeted to. An user registers on your website or posts an ad. An user account is created and the user goes to Edit Profile page and enters his phone number. After updating the profile details, the user will get a verification code by message on his mobile phone, which he will need to enter in the next page. Users can choose to register with their email and password, or to choose to register with their phone number. A user visits your site and choose to register. We send him an SMS with a code. He enters the code, if valid. We ask for name and email. Registered user visits your site and wants to login. He choose to login with phone number and enters his number. If the number is valid and a profile account with that phone number is found, we send him a code. The user enters the code. If the code is valid, he tuser will be successfully logged in!